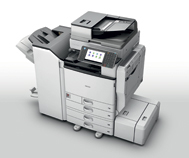 The AficioMPC4502AD/MPC4502SPDF/MPC5502AD/MPC5502SPDF are the ultimate document solutions: performance colour MFPs that think with you. High productivity, fast turn-around, smart cost savers. All underpinned by an intuitive interface packed with efficient workflow and connectivity features. These MFPs not only meet international security and environmental standards. With their extra safety, compliance and energy-saving options, they let you determine just how green and secure your workplace needs to be.